What Are Movement Joints? What Do I Need To Know When Tiling? Home Tiling Advice What are Movement Joints? Movement joints are an integral part of any ceramic tile or stone installation. The various components of a tiled assembly (covering, adhesive, substrate, etc.) have unique physical characteristics that affect their behavior. Specifically, these components will expand and contract at different rates, according to each component’s intrinsic physical properties, with changes in moisture, temperature and loading (both dead and live loads). The differential expansion/contraction of attached components results in internal stresses. Furthermore, structures that restrain overall expansion of the tiled field (walls, columns, etc.) cause stress build up within the system. If the aforementioned movements are not accommodated through the use of movement joints in the tiled field and at restraining structures, the resulting stresses can cause cracking of the grout and tile and de-lamination of the tile from the substrate. Thus, movement joints are an essential component of any durable tiled assembly because they relieve the stress by deforming. 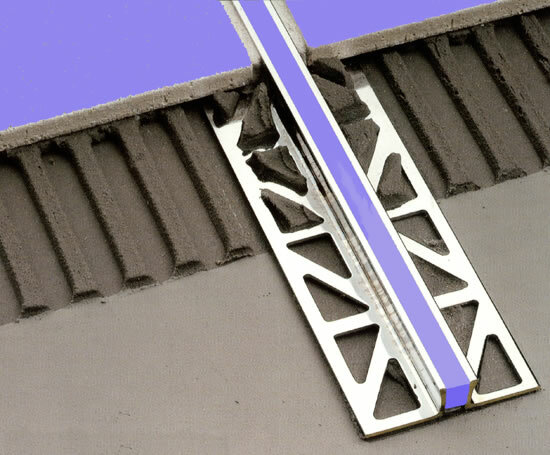 Movement joints can be formed in the floor and wall by using suitable sealants or pre-formed movement joint profiles, typically comprising PVC or metal anchoring legs connected to a flexible synthetic movement zone. Normally sealants can be used in low traffic floors, e.g. where neither the edge of the ceramic tile or stone flooring unit, nor the sealant will be exposed to high levels of impact or abrasion. In high traffic environments the sealant will not protect the edges of the ceramic tile or stone flooring units and these may become damaged. The following types of Movement need to be taken into consideration prior to the commencement of laying tiles in order to prevent damage if movement does occur. This is a reduction in the size of materials when moisture is reduced. The potential for this movement is underestimated in practice and usually occurs when insufficient drying times are allowed for in situ backgrounds such as cementitious screeds, concrete, block work, gypsum plaster etc. Drying times are generally based on optimum drying conditions of 20°c; 65% relative humidity with adequate ventilation. Thickness, density and mass of these in situ constructions also have to be considered as backgrounds like power floated concrete can take longer to dry than expected. In reality tiles get fixed before all background shrinkage has occurred, the amount of stress that can be restrained by the adhesive depends on the background strength, the characteristics of the adhesive used and the level of adhesion achieved. Any residual shrinkage can compress the tile bed laterally and can cause delamination, even when movement joints are used. This is movement that occurs between different background types or changes in construction. At these locations, cracks develop and are visible where finishes do not obscure. Cracks happen here because of movement between differing materials which are abutting. While any movement may be minor, depending on the materials the differential movement can be huge and also unpredictable. This type of movement is frequently seen on timber subfloors which are suspended, and also walls which have been constructed using unsuitable boards and sheets. Damage to the tile bed is most likely to occur where the tile bed is placed under tension. All materials expand and contract at different amounts. The integrity of the individual tiles from the effects of changing temperatures is not an issue. Problems are likely to arise if the potential movement differences between expansion and contraction are not considered. This type of reversible movement is the result of the expansion and contraction of materials to changing moisture conditions and is experienced where wood based material are used as a backer for tiles. Intermediate substrates or tile backer boards such as No More Ply are available to minimise the effect of these conditions. Large areas of concrete that are in situ, can take many months to dry and the shrinkage that occurs can be huge, therefore the anticipated shrinkage has to be accommodated by large mechanical joints which are installed under advisement of a structural engineer. For more information on Movement joints please feel free to contact the Atlas Team on (01425) 621173 or via email: info@atlasceramics.co.uk.